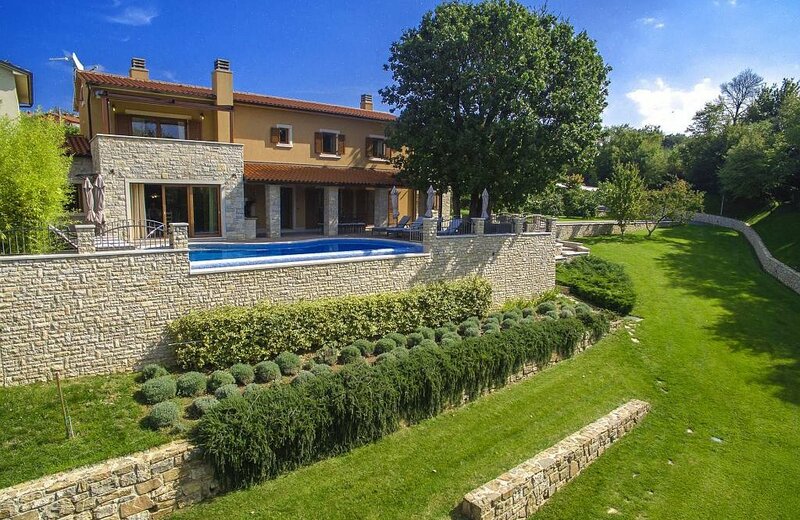 Villa Vlastelini is a luxury property on the edge of the suburb of Labin Kapelica. The whole plot extends to 20000 sqm of which 7000 sqm are at guests` disposal. The following outdoor facilities are available: a private tennis court with night lighting, green golf course of 300 sqm with 7 holes (golf sticks available), private swimming pool of 40 sqm with 8 sun loungers and sunbed and covered parking for 4 vehicles. 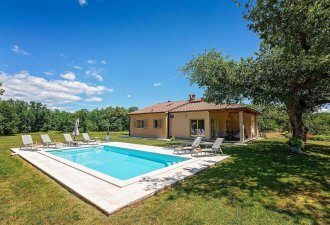 The discreet house owner lives in the neighbouring house with separate property so that the guests of the Villa Vlastelini enjoy a high level of privacy. On the property of the landlord, the guests can visit a sheep farm and chickens and from the bio garden they can pick their own vegetables (without additional costs). Luxury holiday home in Labin with a living area of 265 sqm on two completely air-conditioned floors for 8 persons. On the ground floor there is a living room with sofa, satellite TV and fireplace, dining table for 10 persons and fully equipped kitchen, a double bedroom with shower/toilet and a separate toilet. On the first floor are in total three bedrooms, each with double bed, satellite TV and a private shower/toilet. Two of the rooms have a balcony with sitting set. On the ground floor is a smaller tavern with separate entrance with equipped kitchen, large dining table and a separate toilet. IMPORTANT: The Wi-Fi signal is available throughout the house and on the area of the pool due to signal amplifiers.